The Parvus House team is excited about the People’s Tiny House Festival coming up August 3-5 on the Air Force Academy campus in Colorado Springs. 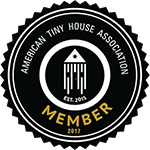 The event is going to showcase all elements of tiny and sustainable living, so we’re looking forward to seeing old friends, meeting new ones, and learning more about what’s new in the tiny house movement. The event will also feature live music, food trucks, vendors, and keynote speakers. Tickets are $15. Use promo code ‘peoplesfest20’ for 20% off!